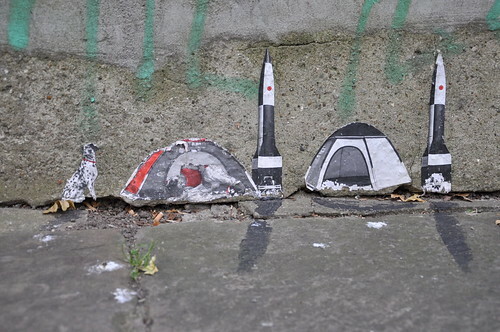 Lilliputian tableaus started appearing at ground level in London about 2 years ago, firstly there were Georgian doorways, then a diaspora of ladies plying a darker trade followed more recently by surreal man-animal-space vehicle compositions. 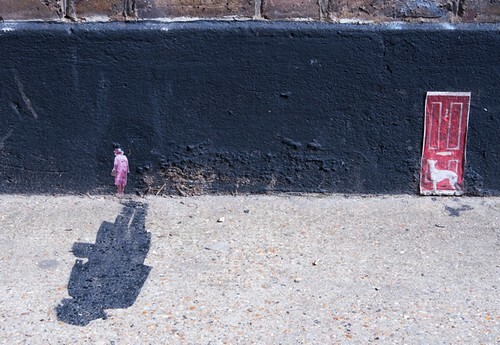 Figures and animals were always emphasised with shadows painted on the pavement. 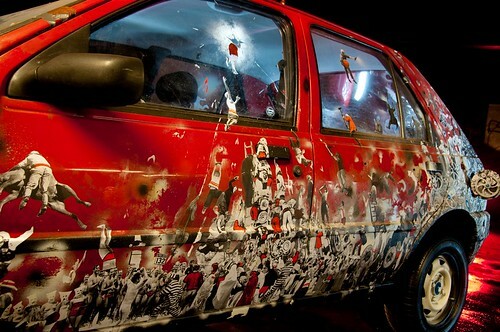 The artist responsible was Mexican Pablo Delgado, resident in London. 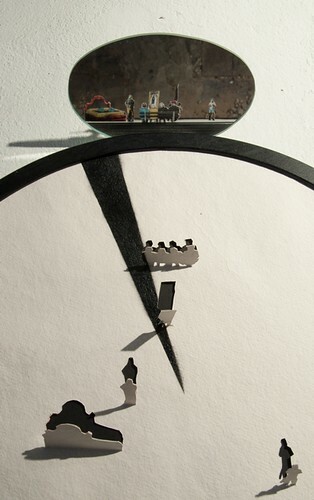 A brief small scale show in the Pure Evil gallery in late 2011 was followed by a major automobile work at the Banger Art show in June of this year. The Banger Art show marked Delgado as a serious worker of themes and concepts., the current show at Pure Evil gallery is going to open the eyes of anyone who thought Delgado just worked with magazine cut outs slapped on a wall. Upstairs are a couple of large framed compositions whose cut out figures are said by Deglado to represent where all his work begins, the selection of figures. The most fascinating pieces downstairs are a collection of 6 mirrored tableaus, the outlines of figures are raised from the surface of a card mounted on a circular frame and hung so that anyone less than say 20 feet tall could not possibly look down at the image. 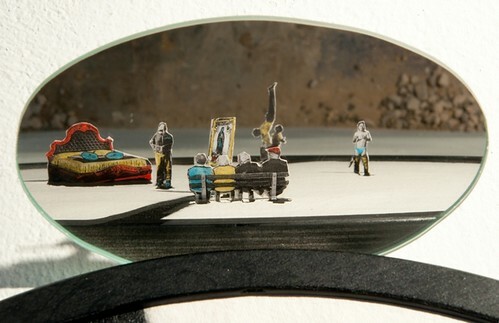 Viewing is by means of their reflection in a tilted mirror above the piece. 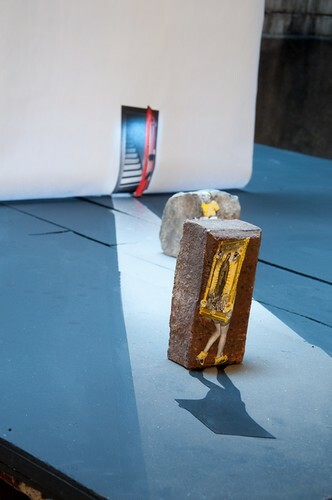 The view throws the floor underneath the piece up as vertical backdrop to the scene, this makes the world look like various planes have been cracked and twisted, what is vertical we see as horizontal and what is floor we see as a desiccated crumbling cliff. As if the actual scene itself wasn’t sufficiently surreal. 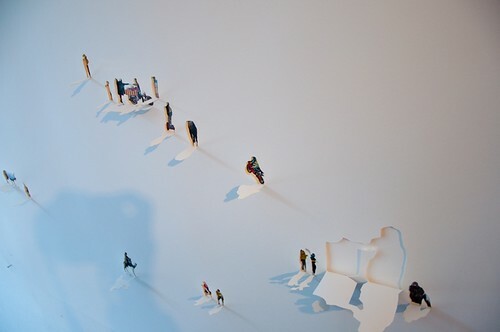 The effect of evidently drawing on paper, cutting and folding out the outline then viewing from behind is played on with several of the larger drawings on paper. One would imagine that in any normal domestic environment there is surely a high risk of the cardboard outline getting damaged, or perhaps that just NoLions Towers. 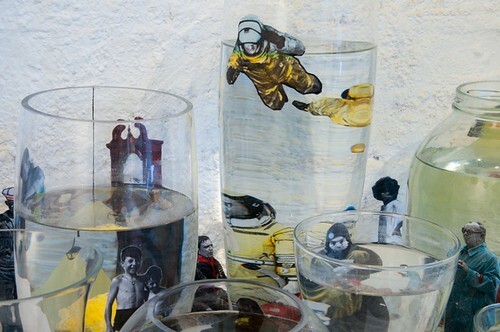 A collection of water filled jars provide a lens to distort the view of miniature divers, looking like a gathering of Borrowers holding a fetish party. Delgado relishes playing with light, we knew that from the painted shadows associated with his street pieces, and a large proportion of the work in this show delights in playing with light, optics and geometry. The painted beam of light in this piece was so convincing the viewer is inclined to seek the source of light behind the hanging picture. 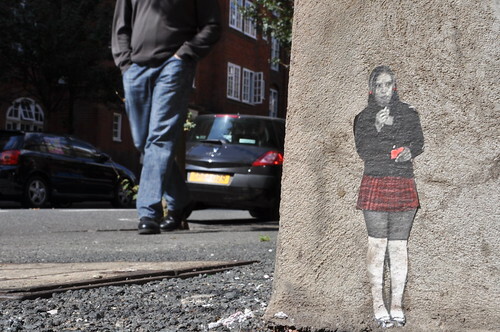 In a show where the bizarre is the norm and the surreal is commonplace, one of the weirdest aspects is the sight of shadows without their casting figure, a sight which is also common on the streets where the paste up has disappeared through natural causes – decay or theft. 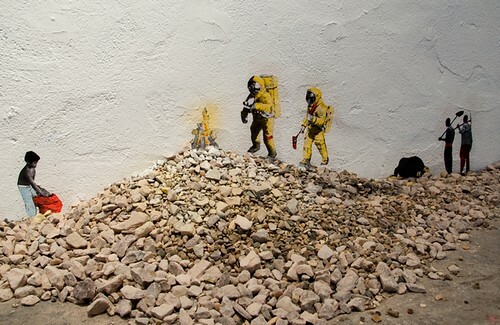 In this show Delgado surprises us with the development of his techniques but that element of cute humour present in his simpler street works has not evaporated in the translation. A very enjoyable and intriguing show well worth a visit. Like a visitor to Disneyland, that other well known land of suspended disbelief, be prepared to discover that it's a small world after all. Ready mades – the term coined by Duchamp when he elevated everyday pissoirs to works of art – is annexed by Poland/NY artist Olek to describe in one way the main form of her work, "Crochet Readymades". It is worth googling the images of the effect she has when she cloaks public sculpture in crochet art. There is a lot more to her work, including performance art where she dresses up volunteers in full body crochet morph suits to interact with the public. 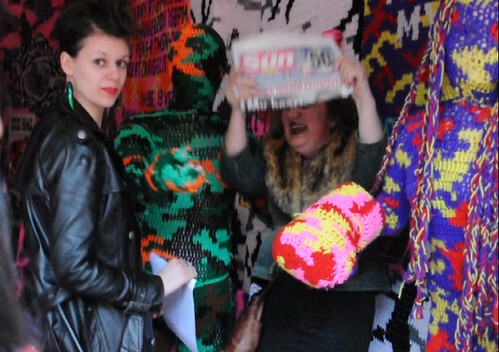 Amusing interaction,man in Olek crochet body suit, Olek UK Solo show 2012. Anyone who thinks slavery died out with the 19th century deeds of William Wilberforce and the Slavery Abolition Act needs to take a peek around themselves, detention and exploitation thrives all around us, even here in London where immigrant workers have their passports confiscated by gangmasters, are obliged to live in insanitary overcrowded conditions at exorbitant rent and paid such a pittance that they are never out of the debt of their gangmasters. Olek is showing her support for the work of slavery international by hanging this massive four panel crochet piece at Village Underground, London this week. Here is a very short time lapse of the panels being installed - Click through to view it properly on Olek's Vimeo stream! Olek In London from olek on Vimeo. The “Injustice anywhere is a threat to justice everywhere” quote is from a letter written by Martin Luther King from a Birmingham (Alabama) Jail in 1963. Olek - Free At Last? 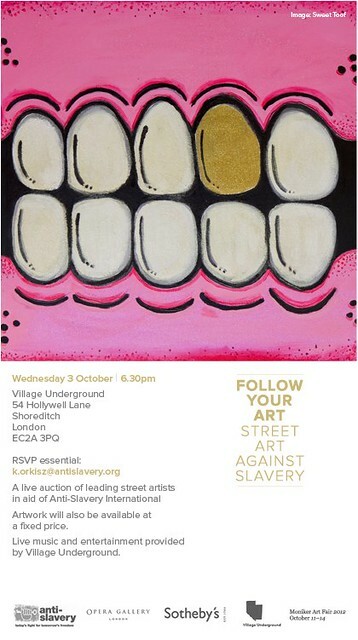 Village underground hosts an art show and auction this Wednesday (3rd Oct 12) staged by Street Art Against Slavery to benefit Anti Slavery International. Details of the auction can be found HERE. 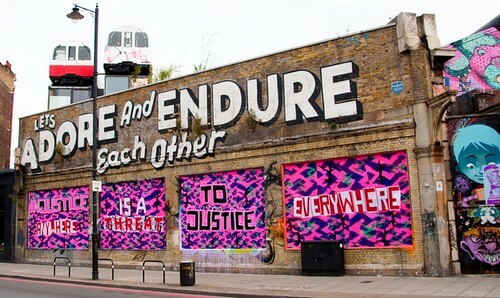 Olek is supporting this cause and her piece on Great Eastern Street is part of the event. 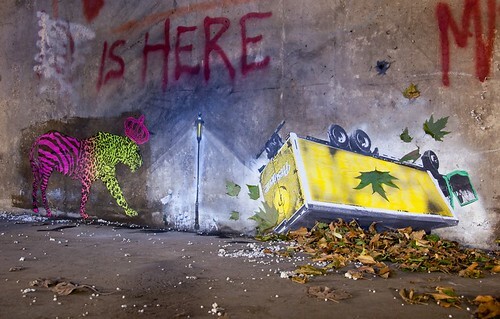 While addressing this worthy issue it is worth mentioning a couple of other closely related street art interventions. Firstly, insulation tape artists AD/SO who also has donated work to the Street Artists Against Slavery auction executed this stunning 8 story piece on the multi storey car park very close to Village Underground. 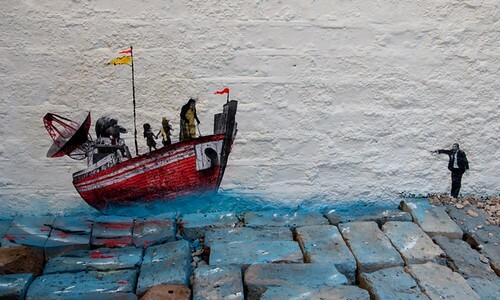 We also came across this Mear One piece “Freedom For Humanity” looking stunning on Hanbury St. Finally, Dr D has been getting up some paste up to show support for a documentary exposing labour exploitation and its consequences in the cotton trade, and if there is one thing we have learned about Dr d its that he only does good cause. 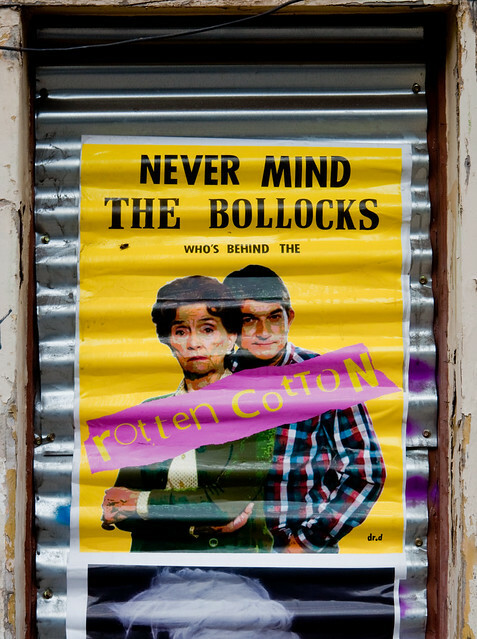 The Cotton Film: Dirty White Gold is being produced by Leah Borromeo (some readers may know her by the name Montris), the film needs some funding and Dr d. is releasing this Dot and Nick Cotton (venerable and slightly un-hinged stars of UK soap opera Eastenders”) print to raise funds to support the production of this film. Details of the fund raising and Dr d print are HERE, support it! 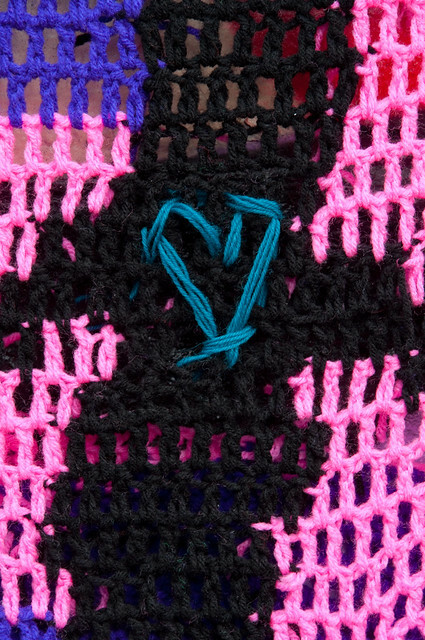 Wrapping up on a lighter note, the day after Olek installed the crochet work, someone darned (damn – I hope that is the right word) a heart into the piece overnight. A wool love tag. Wow! Piece over tag, yarn outline over Crochet Readymade, whatever the unwritten rules of crochet piecing and tagging are its lovely to see wool dogging is nice and sweet and supportive!